A common buzzword used in the car audio world is car subwoofer SQ or Sound Quality. SQ is much more difficult to quantify than say, SPL, the sound pressure level (the boom in subwoofer). Although there is no hard spec that identifies SQ, it is always good to talk about sound quality in a car sub. If we define subwoofer SQ as the accurate reproduction of the low frequency (bass) signal input to the low frequency (bass) output, there are big differences from one sub to another. Generally, more expensive subwoofers are built with better voice coil control, among other features, that improves the sound by reducing distortion and reproducing the input signal more accurately. And note that this control becomes more difficult as the music is played at higher volumes. Some subs are designed and/or tuned with enclosure design, to achieve more SPL even at the sacrifice of SQ. Some customers don’t worry about sound quality, only that their subs rattle neighborhood windows, and more power to them. But what about enthusiasts that want their music to sound like the original even at high volumes? If the “SQ car subwoofer” is meant to be superior in sound quality, then voice coil control is an important factor to evaluate. Controlling the voice coil attached to the cone to accurately follow the tiniest input signal differences and the most dynamic signal changes makes the difference in music clarity and quality. It means your music sounds as the artist intended with nothing being lost. And if the subwoofer is not designed well, distortion, aka noise, can be introduced into the music that further degrades the quality of the original. 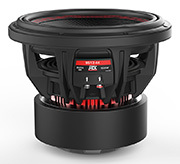 MTX Audio knows car subwoofers. We have designed some of the most iconic models ever released. Competitors around the world have won numerous competitions based on SPL and SQ using MTX subwoofers. We are introducing our new 95 Series ‘Superwoofers’.If there ever was a subwoofer that could be called both a superior SPL sub and a superior SQ sub, this is the design. These are tricky specs to measure in any fashion since enclosure and vehicle type vary so differently from one system to the next. There are many variables to figure into the equation. But we welcome honest tests where the environment is identical and measurements are accurate. We feel confident you will be impressed with MTX. So is it useful to talk about SQ versus SPL subwoofers? Yes, sound quality is important. Your ears literally get tired listening to distorted music. And the bass instruments and reverberations just don’t sound as crisp or hard hitting as the original performance. That’s not good. And the best subwoofers can hold control even at loud volume. That is why great musicians spend a lot of dollars on their concert speakers. So whether you are into SPL or not, SQ is something to pay attention to as you choose a car subwoofer. There is no spec that will you tell which sub has better SQ than another, but pay attention to subwoofer technologies that can help predict performance before you make your decision. Sealed or Ported Subwoofer Enclosures - Which is Better?